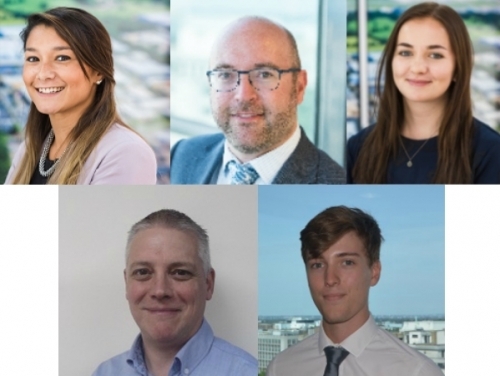 Carlie Cheall, (pictured top, left) is a Senior Surveyor for the Professional Division specialising in Education and Healthcare based in Crawley. She has previously worked in a surveying role for TSP, having qualified with them in 2016 and assuming the responsibility of portfolio and lease manager for numerous charities. Chris Heather joined us as a Senior Planner in our Croydon office. Chris has over 14 years of planning experience working with - companies such as Savills Planning consultancy across four London Boroughs. Lizzie Oliver has also joined us as a Graduate in our Crawley Professional Team. Lizzie has considerable work experience from placements with the Valuation Office Agency, Linden Homes and Fawcett Mead. Our Property Management Team’s expertise has been expanded by the appointment of Facilities Manager Jeff Snelling (pictured left second row). Jeff has in excess of 15 years’ experience working in a managerial, operational and security capacity for a multitude of firms across the higher education, health and private sectors. Harry Richards also joined us as a Graduate Surveyor on Industrial placement with the Croydon Building Consultancy Division. Harry has just completed his second year at university and will be joining us for a year to gain experience within the industry. If you are interested in finding out more about a career with SHW contact our HR team at recruitment@shw.co.uk.